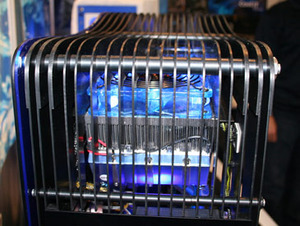 CeBIT 09: Always on the lookout for new mods at CeBIT, we came across this case cooling shell from Kobalt. 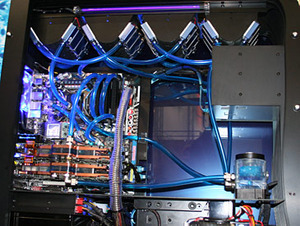 Inside it houses four CoolIT Elite multi-TEC coolers chilling two watercooled loops for every component. It has a Core i7 965 running at 4.4GHz, a Rampage II Extreme with Full EK water cooling, 6GB of OCZ Flex EX DDR3 1,866MHz (unique to this system), quad SLI BFG GeForce GTX295 with EK waterblocks and a Be Quiet! Dark Power Pro 1,200W PSU. This Kobalt Blade chassis is the very first one to roll off the Kobalt factory line and even though it feels solid and it looks great, it’s still early days according to the team. Chatting over lunch, they were confident the case would pass EMC testing, but it might require some meshing on the inside too – just minor tweaks to bring it up to Kobalt standard, though as it is it adheres to the necessary specifications for sale. The entire chassis is 100 percent aluminium and the CoolIT Elites sit in the top with the hot air venting upwards and outwards. The Elites are designed to make use of multiple TEC coolers – each one works at just a fraction of its rated value as the power consumption to cooling ratio drops off the more volts are passed through. The CoolIT guys found that by running several together instead of just a couple the cooling performance was far more efficient (but inevitably more expensive). The Elites are the upper end of CoolIT’s new range of cooling hardware – the most interesting of which is a new £65 sealed watercooler with active control that’ll last five years, apparently cool anything and fits wherever there’s a 120mm exhaust fan. Naturally, CoolIT claims it’s better than the Asetek LLC kit, but while this latest product does impress us, previous CoolIT kit has left a lot to be desired. 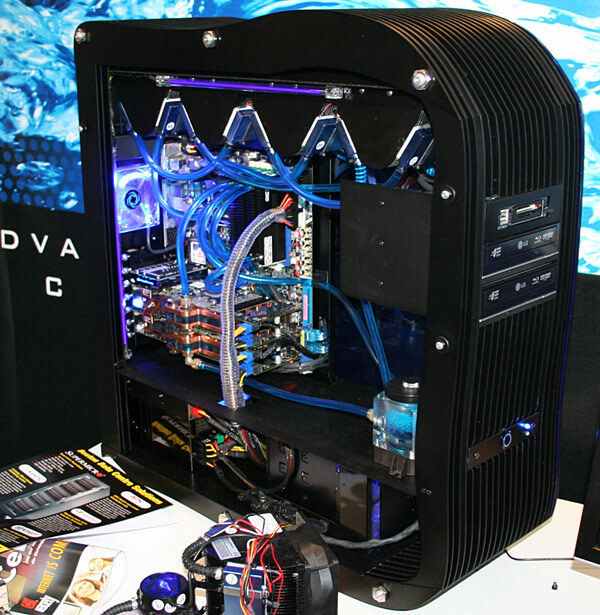 Antec's latest CPU cooler is an all-in-one water-cooling kit; we find out if it can beat the heat.